Microencapsulated phase change materials (MicroPCMs) are very small bi-component particles consisting of a core material – the PCM - and an outer shell or capsule wall. PCMs are low melting materials with melt points in the range of -30°C to 55°C, that can absorb and release large amounts of heat. The capsule wall is an inert, stable polymer or plastic. Microencapsulation may be defined as the process of surrounding or enveloping one substance within another substance on a very small scale, yielding capsules ranging from less than one micron to several hundred microns in size. Microcapsules may be spherically shaped, with a continuous wall surrounding the core, while others are asymmetrically and variably shaped, with a quantity of smaller droplets of core material embedded throughout the microcapsule. There are almost limitless applications for microencapsulated materials.One application increasingly utilized is the incorporation of microencapsulated phase change materials (PCMs). 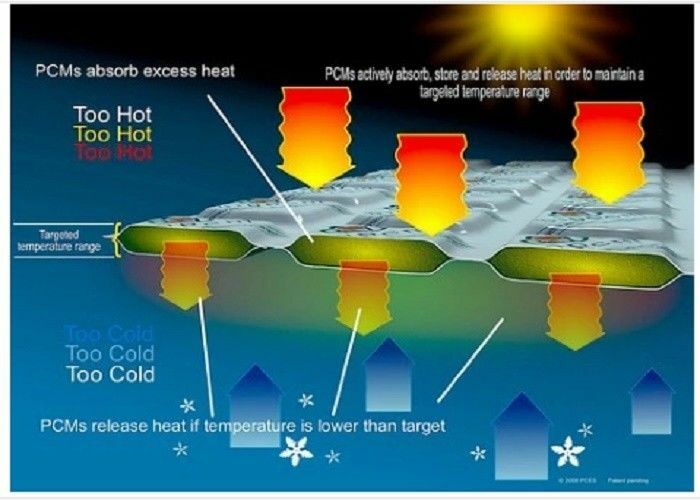 Phase change materials absorb and release heat in response to changes in environmental temperatures. When temperatures rise, the phase change material melts, absorbing excess heat, and feels cool. Conversely, as temperatures fall, the PCM releases heat as it solidifies, and feels warm. This property of microencapsulated phase change materials can be harnessed to increase the comfort level for users of sports equipment, military gear, bedding, clothing, building materials, and many other consumer products.